The Cora Group’s innovative evolv1 project celebrated its grand opening today with a ribbon cutting ceremony and tours of the iconic Waterloo building. Designed and engineered by Stantec, evolv1 is Canada’s first commercially-driven, net-positive building – it produces more energy than it consumes. The 110,000 square foot evolv1 has already been the recipient of prestigious awards, certifications, and accolades. In April, the multi-tenant building was one of 16 elite projects across Canada to be selected by the Canada Green Building Council (CaGBC) to participate in a two-year pilot of its new Zero Carbon Building Standard. evolv1 was also the first building to earn the Zero Carbon Building – Design certification. In June, evolv1 captured the first-ever Zero Carbon award, also from the CaGBC. One of the biggest challenges to achieving net-positive is that evolv1 is a multi-tenant building. Looking to the future, evolv1 is already well-positioned to be a disruptive force to traditional energy generation. 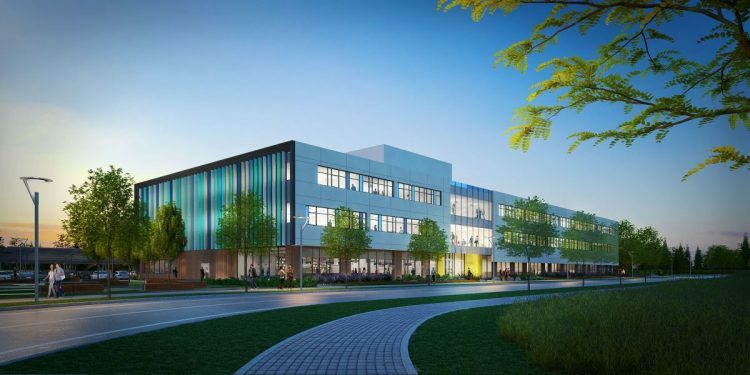 The evolv1 vision is a collaboration between The Cora Group, Sustainable Waterloo Region, The David Johnston Research & Technology Park, and anchor tenant EY. The building was constructed by Melloul Blamey and is targeting LEED® Platinum certification. Stantec’s highly integrated design process incorporates active and passive systems to optimize value against construction cost. The high-performance building envelope incorporates triple glazing, a solar wall for preheated ventilation, a geo-exchange/VRF HVAC system, three-story green wall, and a combination of photovoltaics, or solar panels. evolv1 is also home to the Waterloo tech company, TextNow, and to evolvGREEN.